Glycated Hemoglobin test is considered the gold standard for monitoring diabetes. It gives an average value of sugar over the past four months. In simple words, glycated hemoglobin forms due to a slow reaction between hemoglobin in red blood cells and glucose. The average life time of red blood cells is 120 days. Thus the percentage of glycated hemoglobin with respect to total hemoglobin gives an average value of sugar over the past 120 days. Glycated Hemoglobin precisely does this. 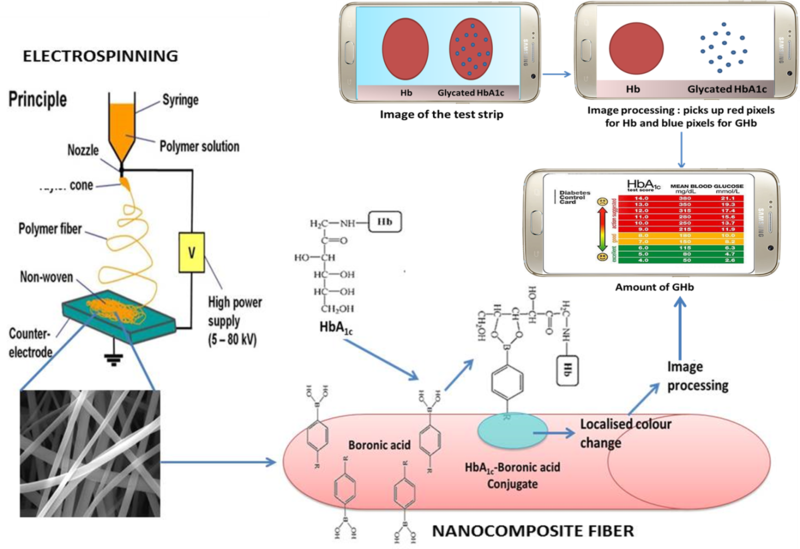 In the project, we are going to develop a paper based device in conjuction with a smart phone to perform glycated hemoglobin test. The user needs to put drop of blood on two locations and take a snap shot. The value of percentage glycated hemoglobin would be displayed using a smart app. At the same time, the user also gets to know the concentration of hemoglobin. The project combines nanotechnology and image processing. Nanotechnology is used for binding and colorimetric detection of glycated hemoglobin and hemoglobin. Image processing is used for extracting the color intensity values, which are proportional to the concentration of hemoglobin and glycated hemoglobin. We believe this simple, paper based device would make the Hba1c test accessible to all.